Tanzania minister for livestock and fisheries, Luhaga Mpina (right), receives a copy of the Tanzania livestock master plan from Barry Shapiro, senior livestock development advisor at ILRI (photo credit: Eveline Massam/IITA). 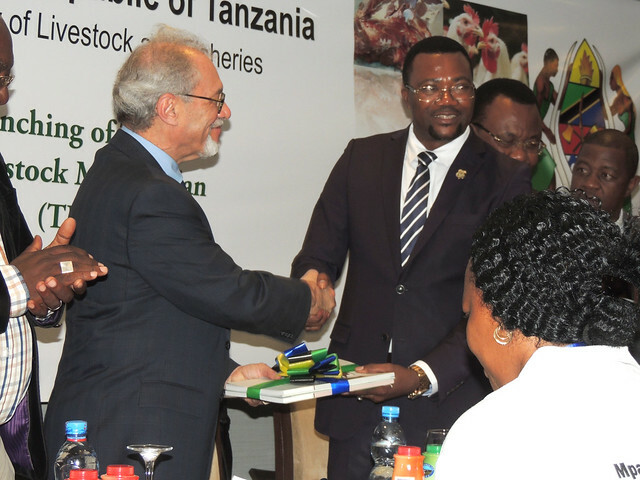 Tanzania’s livestock sector is set for a major boost following the official launch of a TZS1.4 trillion (USD596 million) Tanzania livestock master plan (TLMP). The TLMP is a five-year plan geared towards addressing major challenges facing the sector and transforming it by guiding investments in major subsectors. To realize the TLMP, at the request of the Government of Tanzania, the International Livestock Research Institute (ILRI) provided technical assistance and training to the Tanzania Ministry of Livestock and Fisheries in a project funded by the Bill & Melinda Gates Foundation. A livestock master plan is a vision-driven, evidence-based road map with investment plans that seeks to improve animal productivity and production, as well as increase the value addition of key livestock value chains. 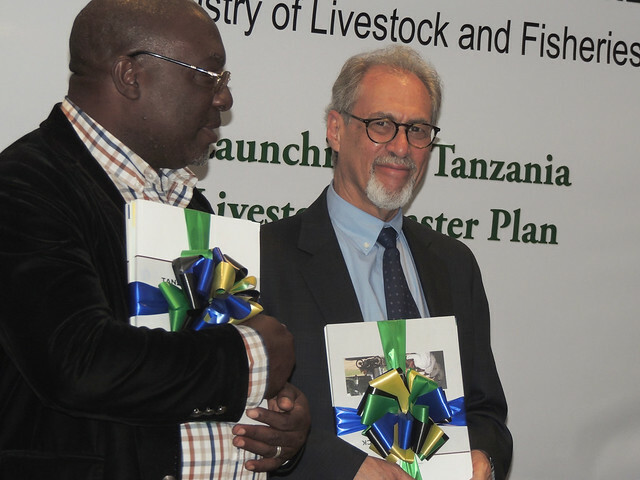 The launch of the TLMP, on 10 March 2019 in Dar es Salaam, follows a consultative and analytical process that examined the various aspects of livestock sector development such as investment, demand, consumption, gender and social inclusion as well as a review on what implementation of the plan should entail. The TLMP sets out livestock-sector investment interventions, which will help Tanzania meet its development targets by improving productivity and total production in the key livestock value chains of poultry, pork, red meat and dairy. Despite being ranked second in Africa in terms of cattle population, according to the country’s National Bureau of Statistics, livestock-related activities contribute only 7.4% to Tanzania’s gross domestic product (GDP) and growth of the livestock sector at 2.6% is low. Coupled with this, the absence of a roadmap to develop the livestock sector has persistently hindered successful implementation of previous investment plans for the sector. While officiating the TLMP launch, the Tanzania minister for livestock and fisheries, Luhaga Mpina, praised ILRI’s role in the creation of the master plan saying that ‘the TLMP [will] guide livestock-sector investment interventions in improving genetics, feed and water resources, health services, industry and factory and promote private sector investment and business environment’. Barry Shapiro, a senior livestock development advisor at ILRI and team leader for the development of the TLMP, expressed gratitude at the progress made that led to the launch of the master plan. He said that the livestock sector accounts for around 30-40% of agricultural economies in many developing countries but public investment often accounts for only 3-4%. Moreover, he added, the TLMP development team found that 70% of potential value-added livestock products are not realized because Tanzania does not have enough industries. But the livestock master plan is set to address this and other challenges through the training provided to government experts and planners to carry out fact-based and realistic investment planning and implementation. Barry Shapiro, senior livestock development advisor at ILRI (right) with the chair of the Tanzania parliament’s Agriculture, Livestock and Water Committee, Mahmoud Mgimwa, during the launch (photo credit: Eveline Massam/IITA). Minister Luhanga said the government will invest a total of TZS1.4 trillion in livestock sector development over the next 5 years. He further stated that about 64% of this amount is expected to come from the private sector while the government will contribute the rest, in what is seen as efforts to foster public-private partnerships for livestock development in the country. The plan lays out several strategies to boost the livestock sector including the establishment of more ranches for meat cattle; growing or importing more feed; increasing the coverage of vaccines for local chicken and better management of African swine fever. The TLMP also calls for initiation of more and better capacity building programs to improve technical expertise in the sector, and increasing industries for meat production, milk processing and leather processing. Available statistics indicate that Tanzania accounts for about 1.4% of the global cattle population and 11% of African cattle population (FAO 2014). The country has about 30.5 million cattle, 18.8 million goats and 5.3 million sheep; while other livestock include; 1.9 million pigs, 38.2 million local chickens and 36.6 million improved chickens. The livestock sector employs about 50% of Tanzania’s population which is equivalent to 4.6 million households whose income depends on livestock. With this in mind, it is anticipated that implementation of the TLMP, will serve to improve performance of the sector and contribute to reducing poverty, raising the country’s GDP, increasing food and nutrition security and creating additional employment. These among others are part of the measures being put forward to help achieve the Tanzania Development Vision 2025, in which one of the goals is that ‘by year 2025 there should be a livestock sector, which to a large extent shall be commercially run, modern and sustainable, using improved and highly productive livestock to ensure food security, improved income for households and the nation while conserving the environment’, Stephen Michael, TLMP project coordinator, explained. The development of the TLMP was the result of a collaborative methodology development effort involving among others the Tanzania government, the World Bank, the French International Agricultural Research for Development Institute (CIRAD), the Food and Agriculture Organization of the United Nation (FAO) and ILRI. Read more on other successful livestock master plans: Bihar (India) and the livestock master plan, Ethiopia livestock master plan.